Warming temperatures only mean a hotter real estate market. For those buyers who are already out searching for homes, that means finding a West Knoxville home is only going to get tougher. More buyers means more competition and more competition meanings finding a house is only going to get harder. 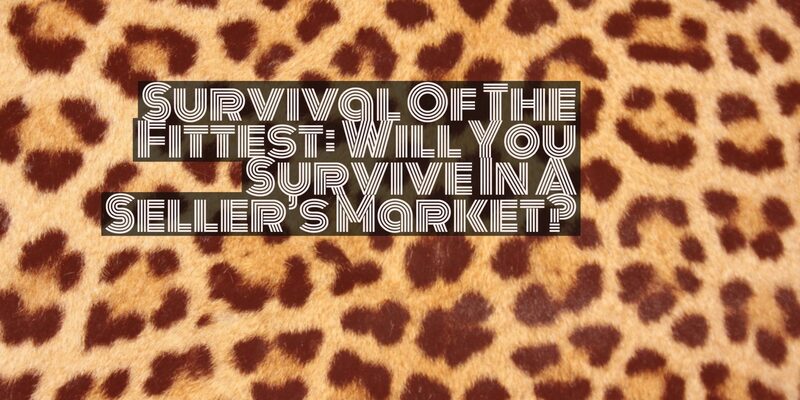 This begs to question: will you survive in a seller’s market? In this post, we’ll help answer that question and offer some tips to make finding a West Knoxville home a bit easier. Do you remember summer reading in high school? You’d be required to read a few books before the start of the school year, so you’d be ready to discuss them during the first few weeks of school. When you don’t get pre-approved, you end up being the kid in high school who shows up on the first day without doing the required reading. This generally makes you unprepared. There’s simply no reason not to get pre-approved before you start looking at West Knoxville homes. Those who are serious about buying a home do it and those who don’t or “want to wait until they find something” generally aren’t as serious. If you want to buy a home, you’ll go through the steps of confirming that you can buy a home and figure out how much you can afford. There is a good reason why you should and need to be pre-approved. First of all, price is the most important criteria for your home search. How great would it be if you find out you could afford more? Price dictates a home search, so you’re only helping yourself by getting pre-approved. In addition, being pre-approved shows your worthiness as a buyer. When submitting an offer, it helps to show a pre-approval letter from a reputable, local lender. In tough competition, this can sometimes set you apart from other buyers. When there’s not enough inventory, buyers are quickly snatching up homes in a matter of days or even hours. Needless to say, when you’re seriously looking at homes, there is no time to waste. Your best chance of finding the right home is getting to it before other buyers do. That means looking at homes quickly. When you’re waiting for the right home to hit the market, you will find that you’re constantly juggling your schedule to look at homes. This means looking on your lunch break, after work, on the weekends, or even sneaking out of work early to take a quick look. While this type of dedication can get exhausting, it will be worth it when you find the right home. Finding the right home in a seller’s market take dedication. This is a lesson buyers quickly learn once they miss out on a house or two. Traditionally, when buyers find the right West Knoxville home, they’ll take the night to “sleep on it.” Unfortunately, that does not work out so well in a seller’s market, while you’re literally sleeping, another buyer is making a move on the property you love so much. There is no time to waste in a seller’s market. While it can be hard to make such a large financial decision quickly, it may be something you’re forced to do. The best thing you can do to prepare yourself to make a quick decision is to know some basics before you really start looking. First and foremost, know what you’re looking for. Have a list of items that you must have in a home and the items that you want in a home. Make sure that your must-haves are more important than your wants, since those are your necessities. It can also be helpful to address any of your lingering concerns before starting your home search. Do you have concerns about the process of writing an offer? Or, how much your mortgage will be? Or, what things in the contract protect your interest? Go ahead and address those items with the necessary parties beforehand. That way, you’re not being held up by concerns that could have been addressed early on. Finally, buyers tend to forget who is in control in a seller’s market. Natural instinct causes many buyers to want to negotiate too much. In many cases, they are their own worst enemy. Buyers are trying to leverage power they simply don’t have. This will kill you in a seller’s market. Here’s the truth. In a seller’s market, there’s simply not enough houses. Buyers are are fighting tooth and nail for the new ones that hit the market. Sellers are getting multiple offers at or above list price. In a market like this, there’s no room for negotiation. It’s not realistic that you’ll perfect home that just hit the market and get it $10,000 under the asking price. Sorry, sunshine, that’s not how things work in seller’s market. If you really want a home, you’ll be willing to pay the right price for it. Occasionally though, there are the homes that have been on the market that were originally overpriced or need a bit of work. There may be some room for negotiation. Are you thinking about buying a West Knoxville home this year? Please let us know if there is any way that Knoxville Home Team can assist you. Rick can be reached at 865-696-9002 or via email at Rick@KnoxvilleHomeTeam.Com. Kati can be reached at Kati@KnoxvilleHomeTeam.Com. Also, be sure to check out our West Knoxville Home Search Page.